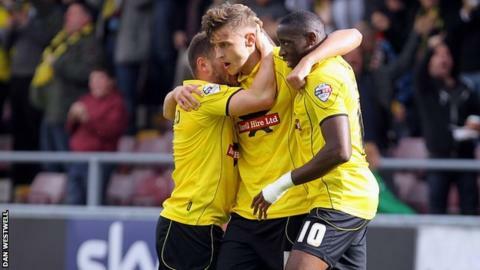 Alex McDonald's stunning late free-kick earned Burton Albion a dramatic win at fellow promotion-hopefuls Northampton. The hosts should have gone ahead when Kaid Mohamed somehow blazed the ball over the bar from six yards when it seemed impossible to miss. Burton took advantage to lead at half-time through Jacob Blyth's low strike. Ryan Cresswell fired the Cobblers level when the Brewers failed to clear but McDonald's shot earned the visitors a second win in five league games. "We've missed chances in the first half. In the second half, they made it difficult for us, sitting behind the ball and sitting deep. "The front four have been good enough for the majority of the season but weren't today. At home, you look for them to spark, and they found it difficult. "We've played OK, but to win games at the top of the league, you've got to play a little bit better than OK.
"Look at the quality of the goal that has done us. Not being greedy - maybe we take a draw and move on. But we always go for a win." "I'm absolutely over the moon. That's probably the biggest result of our season in some ways because we've not been as good as we'd have liked to have been over the last few weeks. "But we're still in a great position and there's still bags of belief in the squad. "You'd think that coming here today and having to change the team at the last minute might have caused a problem, but I have to say I thought all the players were magnificent today. "It was a really really tough game. I thought we worked ever so hard to restrict Northampton to very few chances." Match ends, Northampton Town 1, Burton Albion 2. Second Half ends, Northampton Town 1, Burton Albion 2. Corner, Burton Albion. Conceded by Enda Stevens. Attempt missed. Kelvin Langmead (Northampton Town) header from the centre of the box is close, but misses to the left. Attempt blocked. Ryan Cresswell (Northampton Town) right footed shot from the centre of the box is blocked. Enda Stevens (Northampton Town) is shown the yellow card. Foul by Enda Stevens (Northampton Town). Attempt missed. Ivan Toney (Northampton Town) left footed shot from the centre of the box is close, but misses to the right. Goal! Northampton Town 1, Burton Albion 2. Alexander MacDonald (Burton Albion) from a free kick with a right footed shot to the top right corner. Substitution, Burton Albion. Liam Slade replaces Robbie Weir. Attempt missed. Lucas Akins (Burton Albion) header from the centre of the box is close, but misses to the right. Foul by Daniel Alfei (Northampton Town). Goal! Northampton Town 1, Burton Albion 1. Ryan Cresswell (Northampton Town) right footed shot from the centre of the box to the top right corner. Assisted by Daniel Alfei. Lucas Akins (Burton Albion) is shown the yellow card. Corner, Northampton Town. Conceded by Damien McCrory. Substitution, Burton Albion. Marcus Harness replaces Adam McGurk. Substitution, Northampton Town. Kelvin Langmead replaces Alex Nicholls. Substitution, Burton Albion. Damien McCrory replaces George Taft. Substitution, Northampton Town. Daniel Alfei replaces Ben Tozer. Lawson D'Ath (Northampton Town) is shown the yellow card.